We don’t just eat Italian food in this family and you probably don’t either. We love a delicious variety to enjoy just as most people do. Since my husband is half German and we’re in the season of Octoberfest, we thought that it was time to prepare something new that has never been prepared in this little kitchen of ours. In Bavaria, Germamy a traditional dish known as “Schweinshaxe” is customary to serve during Octoberfest. However, you can find it on Bavarian menus year-round. Schwineshaxe (pronounced Sh-whinez-hock-zuh) is a large — no, it’s a HUGE pork knuckle or pork hock that’s slow roasted until crispy on the outside and fork tender on the inside. This really isn’t hard to prepare at all . . . actually it’s just a roast with a slight difference in ingredients . . . dark German beer! Not something that we add to Italian cooking. So follow along the photo steps below and you’ll be ready for Octoberfest in no time! To start with, we can’t cook without garlic, even in Germany! Slice 3 medium-sized onions and place on the bottom of a large roasting pan. The layer of onions prevents the pork from burning in the oven as it roasts for 3 hours. Place the pork knuckle on top of the layer of onions. Press caraway seeds, minced garlic, thyme, oregano, and salt all over the pork knuckle. Pour one bottle of dark German beer all over the pork knuckle. In a 250 F degree oven, slowly bake the pork knuckle for 3 hours. Every hour or so check on the pork and pour about ¼ – ⅓ cup of beer all over it to help prevent it from drying out. During the last half hour of the pork roasting in the oven, get a large DEEP pan to heat the lard (or Crisco). Add rosemary and minced garlic to the hot lard/Crisco. Fry the pork knuckle in the hot oil for 5 minutes on all sides until the entire roast is a beautiful golden brown. Caution: When working with very hot oil, be extremely careful not to tip the pan of hot oil over or move it closer to you because you could easily burn yourself if the hot lard/Crisco spills on you. Take it from someone who knows! I burned both of my legs to such a level of severity when cooking in my parents’ Italian restaurant and ended up in the emergency room! They had a deep-frying machine used for certain recipes, such as their infamous pork tenderloin sandwich (famous in the Midwest where we lived). I was careless and instead of ‘lifting’ the frying basket out of the hot oil, I ‘pulled’ the basket towards me . . . along with all of the sizzling oil! So I beg you . . . please be careful when frying with hot oil. Please share the love and pin this vertical image. Thanks!!! If the pork knuckle is purchased in the frozen state, allow it to thaw out overnight in the refrigerator. 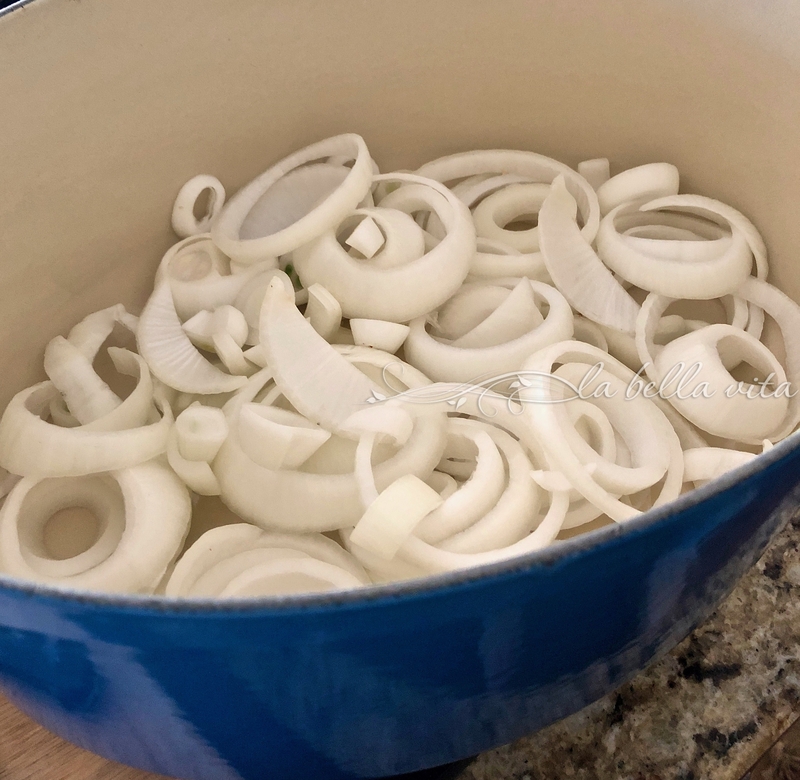 Slice up the onions and layer them on the bottom of a heavy roasting pan. Once thawed, press onto the sides pork the salt, minced garlic, caraway seed, thyme and oregano. 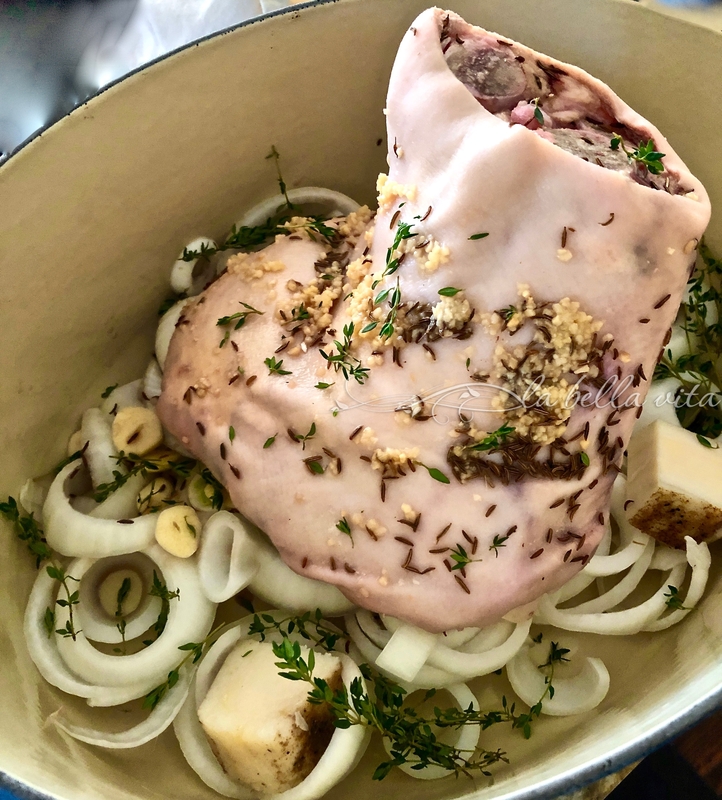 Place the herbed pork knuckle on top of the layer of onions in the roasting pan. Pour one bottle of dark beer all over the top of the pork. Heat the oven to 250 F degrees and roast the pork knuckle for 3 full hours. When there is about 1 hour left to roast, heat and melt about 4 – 5 cups of lard or Crisco. 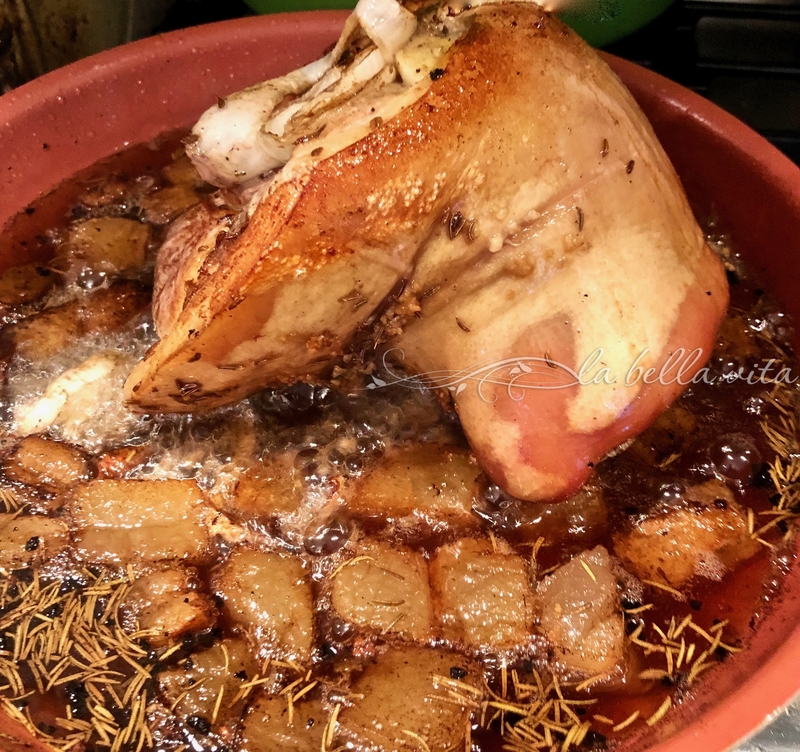 When finished roasting, place the pork knuckle in the hot oil and fry on all sides for a minimum of 5 minutes on each side until the point of having a beautiful golden brown color. Remove and serve with potatoes of any kind and your favorite gravy. wow This looks beyond delicious! An excellent recipe and it doesn’t seem too difficult to prepare. Thanks, Roz! This is definitely a great German dish! I loved the food there when we lived there. Everything’s better with garlic and German beer!